Welcome to Moose Hollow 403! Spend your vacation in Utah's best kept secret! Tucked away in the mountains of Ogden Valley, the Moose Hollow condos are in the center of it all. Relax in front of the gas fireplace, take in the views on the private balcony, or spend your day skiing Utah's famous powder snow, no matter what you are looking for in your vacation, MH403 will deliver! Downstairs: One master suite bedroom, 2 standard bedroom, hallway bathroom, and laundry room. Bedroom 1: 2 Twin beds including a daybed with a pull-out trundle. Bedroom 2: 1 King bed master with ensuite bathroom. Bedroom 3: 1 King bed with shared hallways bathroom. 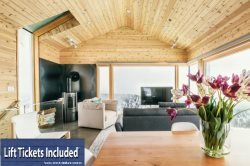 We are truly excited and honored to share our homes with each and every guest and we invite you to stay with us at Powder Mountain Getaways - MH403!